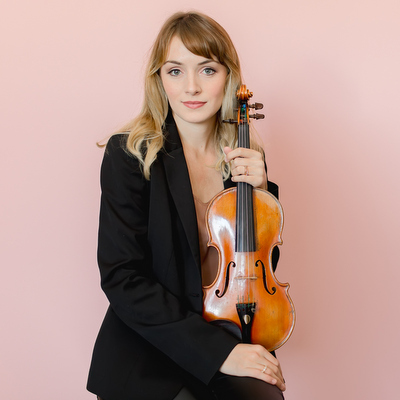 Violinist Madison Vest has performed with multiple orchestras, including the Pittsburgh Symphony, Richmond Symphony, and Fairfax Symphony. Her recital performances have taken her to venues such as the Kimmel Center in Philadelphia and Carnegie Hall in New York City. Ms. Vest has also performed as a showcase performer at The Aspen Music Festival and School, the Encore performance stage in Hudson, Ohio, Heifetz Institute for strings, and The Walnut Hill Arts Festival in Seoul, Korea. Ms. Vest has participated in masterclasses with such distinguished artists as Aaron Rosand, Donald Weilerstein, Soovin Kim, The Rembrandt Chamber Players, Cavani String Quartet, Ébène Quartet, and the Liebesfreud Quartet. Her teachers have included Victor Danchenko of the Curtis Institute, Paul Kantor while attending Cleveland Institute of Music’s Young Artist Program, Shmuel Ashkenasi of the Curtis Institute of Music, and Miriam Fried and Paul Biss of The New England Conservatory. Ms. Vest has a strong desire to teach and participate in community outreach programs in addition to performing. She has had the pleasure of working at the Aspen Music Festival as a teacher in the P.A.L.S program, as well as community outreach with Street Symphony, headed by Vijay Gupta of the Los Angeles Philharmonic. Ms. Vest graduated with a Bachelor of Music degree at the Colburn Conservatory of Music, where she studied with Robert Lipsett. She is currently a Master of Music candidate at Rice University where she studies with Kathleen Winkler.